Everything in the world is made up of matter. Matter is made up of small building blocks called atoms. The idea of all matter being made up of small building blocks that cannot be divided into smaller pieces dates back to a Greek philosopher named Democritus of Abdera who lived in 430 BC. He named the blocks ‘atomos’ which means indivisible. This is the origin of the word ‘atom’ that we use today. Even though some of Democritus’s ideas about how atoms were put together turned out to be incorrect he did start us thinking about matter being made up of smaller building blocks (extremely tiny particles) called atoms. In more recent times scientists have discovered that under extreme conditions atoms can be divided and split. Tiny!!!!!!! Atoms are very very small. They are so tiny that a speck of dirt contains billions of them. Even the biggest atoms are less than a millionth of a millimeter in diameter. This means you cannot see them even with a microscope. Is there more than one type of atom? There are many different types of atoms (more than 100) and many of these atoms have been found naturally occurring on earth. There are approximately 90 atoms that have been found in the earth’s atmosphere, the earth’s crust and in the plants and animals that inhabit the earth. Scientists have made other atoms in laboratories under very special conditions but these atoms are unstable so they disintegrate almost immediately. What is the Atomic Model? Because atoms are so very very small and we cannot possibly see them with our eyes we use the Atomic Model to gain a better understanding of how an atom is arranged. Scientists often use models to help explain concepts that are hard to visualize in reality. It is important to understand however that the Atomic Model is not actually a true picture of what an atom looks like but it certainly does help us better understand how an atom is put together. Atoms are composed of three different kinds of particles. We call these particles sub-atomic. Scientists have shown that every atom contains a nucleus in its center and electrons that rapidly orbit (circle) the nucleus. Despite containing 3 sub-atomic particles an atom is mostly empty space. At the center of the atom is a nucleus, which consists of protons and neutrons. Neutrons and protons have approximately the same mass. Protons have a positive charge but neutrons have no charge. Most of the mass of an atom is in the nucleus. 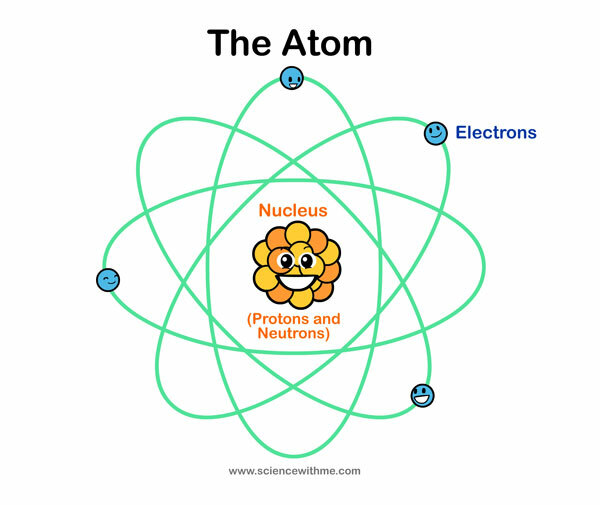 The shells of an atom contain the electrons. Electrons are negatively charged particles that orbit the nucleus, similar to the way in which the planets orbit the sun. Depending on the size of the atom these shells extend farther and farther from the nucleus. Electrons fill up these shells by filling the shells closest to the nucleus first. Electrons in the outer shell are farthest from the nucleus, and therefore the hold the nucleus has on them is much weaker than the hold on the electrons that are in the shells closer to the nucleus. The number of electrons in an atom’s outer shell determines many of its properties. The number of electrons in an atom equals the number of protons. Normally, an atom has no charge overall as the positively charged protons cancel the negatively charged electrons. What is the mass of an atom? The mass of an atom is so small that even very heavy ones like uranium cannot be expressed easily in grams. For this reason scientists decided to come up with a different unit of weight for atoms and therefore the mass of an atom is expressed in atomic mass units (a. m.u.). Using this scale we say that the mass of the lightest element Hydrogen is 1 unit. Almost all the mass of an atom is in the center of the atom and is due to the protons and neutrons. The mass of an atom (in a.m.u.) is therefore the same as the number of protons and neutrons in its nucleus. (The mass of the electrons are so small that we don’t count their contribution). Can an atom be split? When atoms take part in chemical reactions they lose or gain some electrons but the nucleus remains the same. However under extreme conditions like in a nuclear reactor the nucleus of an atom can be split and extra protons or neutrons added to it. Now that you’ve started to learn about atoms here, why don’t you continue learning chemistry and buy our Introduction to Chemistry eBook.